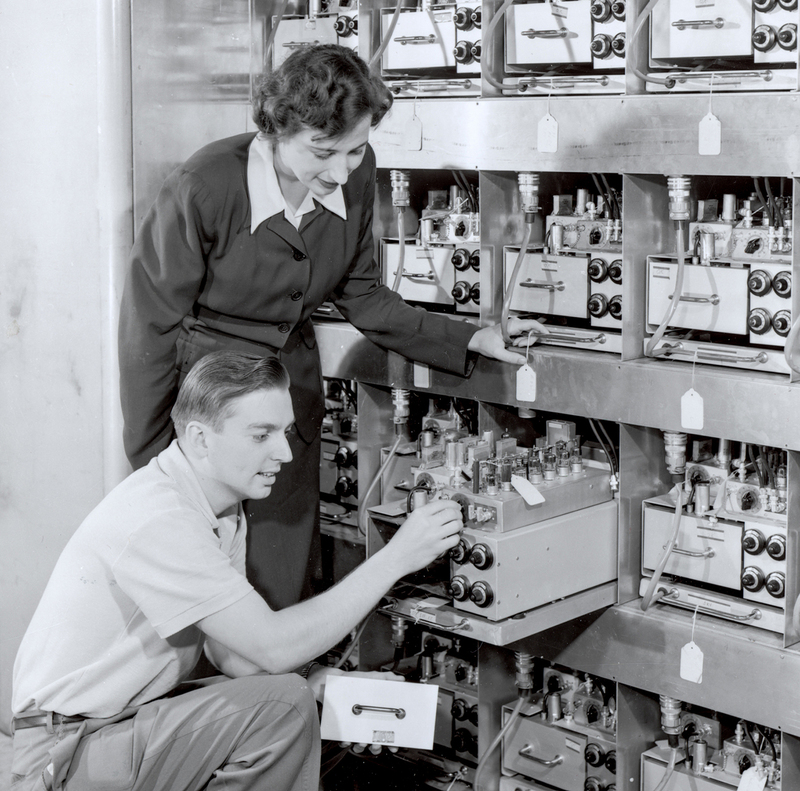 Margaret Butler helps assemble the ORACLE computer with Oak Ridge National Laboratory Engineer Rudolph Klein. In 1953, ORACLE was the world’s fastest computer, multiplying 12-digit numbers in .0005 seconds. Designed at Argonne, it was constructed at Oak Ridge. Margaret Butler was a pioneering scientist who spent her career at the forefront of the development of computer science and nuclear energy. Her spirit, drive, and analytical talents led to a lifetime of scientific contributions during an era when women were a rarity in an R&D setting. As she made her mark, she helped facilitate the careers of many other women in the field of computer science and served as a role model for all women scientists. Margaret Butler, 89, the first female fellow at the American Nuclear Society and director of the National Energy Software Center at Argonne National Laboratory from 1972-91, died of natural causes Friday, March 8, in La Grange Park, Ill.
Born Margaret Kampschaefer in Evansville, Ind., she attended Indiana University on a scholarship, finding her calling in mathematical statistics and differential calculus. She received her bachelor’s degree in mathematics and statistics in 1944, and went to work for the Federal Bureau of Labor Statistics in Washington and later went to post-war Germany to work for the U.S. Army Air Forces as a civilian employee. She also taught mathematics at the U.S. Department of Agriculture Graduate School. After returning to the United States, she was hired at Argonne as a junior mathematician in the Naval Reactors Division. Her job involved using a slide rule to perform calculations for the physicists designing the prototype submarine reactor. She attended classes on site to learn more about the new fields of atomic physics and reactor design. Margaret Butler was the first female fellow at the American Nuclear Society and she was Director of the National Energy Software Center at Argonne National Laboratory from 1972-91. In 1949, Margaret returned to the Bureau of Labor Statistics to work on a project in St. Paul, Minn., and then returned to Argonne in 1951 and married Jim Butler, a fellow mathematician. She became an assistant mathematician in the Reactor Engineering Division and worked on an early computer called AVIDAC. Margaret also wrote mathematical subroutines, systems software, reactor applications, and utilities for subsequent Argonne-built computers, called ORACLE and GEORGE, and for the first commercially available machine, the UNIVAC, in the mid-1950s. She was named Leader of the Reactor Computing Group in 1957. From 1959 to 1965, Margaret led the Applications Programming Section in the laboratory’s Applied Mathematics Division, where she developed programming teams for reactor, physics, chemistry, biology, high energy physics, and management applications problems. In 1960, she also organized the Argonne Code Center, which would later expand into the National Energy Software Center. The National Energy Software Center (NESC) was the software exchange and information center for the U.S. Department of Energy and the Nuclear Regulatory Commission. Computer programs developed under agency sponsorship were collected, tested, and packaged to make them useful to others and were maintained in the center’s software library to be distributed upon request. Margaret Butler was the director of NESC from 1972 until 1991. In 1980, Margaret’s experience and expertise in her field led to her promotion to Senior Computer Scientist. After retiring in 1991, she continued to work at Argonne as a special-term appointee from 1993 through 2006. Margaret not only carried out significant work on computers and related areas, she was also very active in supporting women in science and engineering during her many years at Argonne. Many current and former Argonne employees fondly remember Margaret as an important role model and a welcoming presence when they arrived at Argonne. Together with other pioneering Argonne women, she initiated formation of the Chicago Area Chapter of the Association for Women in Science (CAC-AWIS). The AWIS group organized two successful career conferences for junior and senior high school students, teachers, and administrators. These activities and Margaret’s persistence in keeping tabs on the status of women scientists at Argonne paved the way for today’s programs such as the annual Science Careers Conference and Women in Science and Technology (WIST). The full story of Margaret’s remarkable career can be found at semi​wi​ki​.com. Argonne’s Women in Science and Technology (WIST) program is planning to organize an event honoring Margaret’s life and career. About the author: This article was developed by Argonne’s Women in Science and Technology program, which was created in 1990 to recruit, retain and promote women in an effort to diversify and strengthen the Laboratory’s scientific workforce. The program aims to promote the success of women in scientific and technical positions at Argonne, and outside as well. Through WIST, the Laboratory strives to encourage and develop the full potential of women in science and technology. Created in memory of Margaret Butler, a fellowship at the Argonne Leadership Computing Facility offers computational scientists an opportunity to work at the forefront of high-performance computing.